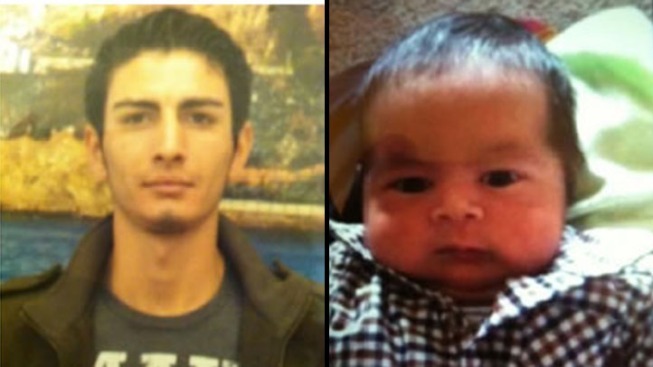 A 22-year-old father accused of abducting his two-week-old baby boy from the Bay Area was arrested by authorities in Mexico Wednesday afternoon, California Highway Patrol officials confirmed. The infant, Henry Guler-Romero, was recovered safely and was unharmed, officials said. The alleged abduction sparked a statewide Amber Alert Wednesday for a vehicle driven by the baby’s father, Mesut Guler. Guler was believed to be driving a tan, 2004 GMC Envoy, license plate No. 6HIL892, with a large American eagle on the rear window. According to the National Center for Missing & Exploited Children, the baby boy was described as Hispanic with no information on weight, height or clothing description. Earlier in the day, the suspect vehicle was spotted in San Diego, officials confirmed. The manhunt for Mesut Guler officially began at 10:30 p.m. Tuesday, according to Sunnyvale Department of Safety Capt. Dave Pitts, who held a news conference Wednesday. "He told the mother he was going to run errands," Pitts said. "And then he left with the child, sending her a text that he would cause harm to himself and the child if police were involved." San Diego police confirmed the suspect’s cell phone signal was detected near Interstate 805 and Balboa Avenue around 11:55 p.m. Tuesday. CHP received a report at 2:08 a.m. that a vehicle matching the description of the suspect’s SUV with the same license plate number was spotted in the Hillcrest area between 9 and 10 p.m. Hillcrest is located approximately 3 miles from downtown San Diego. Just before 3:30 a.m. Wednesday, CHP received a report of the suspect's vehicle in National City. Officers with National City police investigated the tip but found no vehicles in the area matching the description of the suspect’s vehicle. CHP officers said there was another reported sighting called in around 7:30 a.m. near I-805 and State Route 54. The suspect's vehicle description was posted on highway signs around the county. Officials said Guler had been fighting with the baby's mother because he had wanted to move to New York. The baby's mother told officers that Guler had friends in Mexico, prompting authorities to notify the border police to be on the lookout for him, Pitts said. Customs and Border Protection officers and Border Patrol agents were set to assist law enforcement authorities as needed, according to a spokesperson. Officials obtained a $1 million warrant for Guler’s arrest during the course of their investigation Wednesday. By 5:15 p.m., officials announced that Guler was in custody. Officials said Guler had been stopped at a checkpoint in Mexico and questioned by Mexican authorities. Authorities in Mexico then contacted U.S. Border Patrol agents in Lukeville, Ariz., at which point the agents discovered the warrant for Guler’s arrest, officials said. U.S. Border Patrol is now coordinating with authorities in Mexico on the transfer of Guler and his son to U.S. authorities. Child Protective Services will be taking temporary custody of the baby.